The World Peace Foundation’s ‘employee of the month,’ is an award bestowed on someone or something that contributes to keeping the Foundation in business. How do world figures make this contribution? The answer resides in a quirk of our endowment. Edwin Ginn, the founder and benefactor of the World Peace Foundation, was described in a memorial essay as “a forward-looking, farsighted man, who gave generously and planned wisely for the public welfare.”[i] The public welfare included both his unprecedented personal investment in world peace and his support for the working poor. 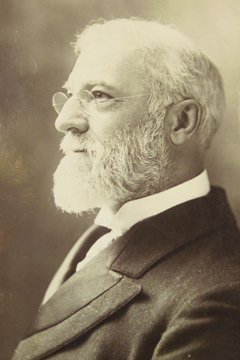 On his death in January 1914, Ginn became the first individual to give one million dollars to the cause of international peace. His will included this generous and visionary endowment, which sustains the WPF to this day. Every year, the three trustees of the Ginn Trust—the custodians of his bequest—vote on whether world peace has been achieved. Thus, the ‘employee’ of the month is someone who keeps the Ginn Trust funds dedicated to supporting the WPF—that is, someone who has made a distinct contribution to preventing the achievement of world peace which would result in the transfer of the Ginn Trust income to the Charlesbank Home. We have tried to identify awardees considering multiple diversity factors: geography, gender (although winners are disproportionately male, and some ungendered items), and mode of contribution. For several years, we have maintained the award without advertising its winner. Among the winners thus far in 2017 are: the House Republican Leadership, Narendra Modi, Nicholas Maduro, Marine Le Pen, Larson C ice shelf, and Fatherland First Facebook Group. This year we have decided to announce each month’s winner on our blog. If you have ideas for nominees, let us know in the comments. [iii] Rotberg, Robert. 2007. A Leadership for Peace: How Edwin Ginn Tried to Change the World (Stanford, CA: Stanford University Press), 65. Amazing. It’s also this humour and resilience that keeps WPF in business and doing this important work. Here’s to fewer employees of the month, and all former awardees of this notable post becoming far less productive! Miss you all.